In 1824, Quaker businessman John Cadbury embarked on his career as a grocer. In 1831 he began manufacturing chocolate, a business he later bequeathed to his sons, George and Richard. In 1897, the sons learned the secret of ‘conching’ and created their first chocolate bar, sold in unwrapped blocks that could be broken down into penny bars. 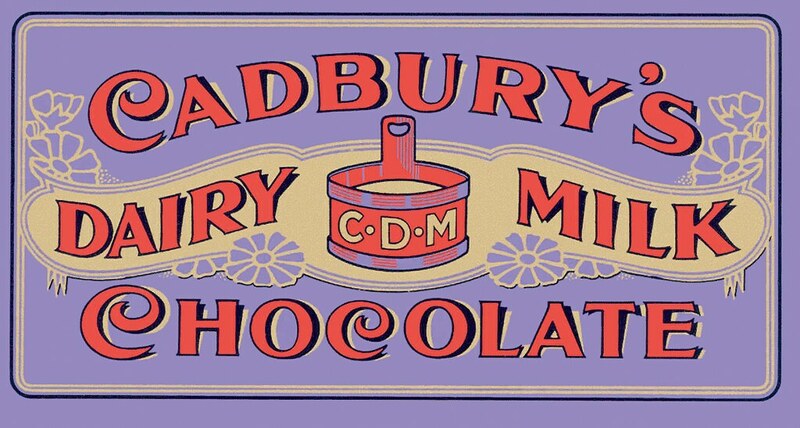 By 1905, George Cadbury had developed Dairy Milk, a bar whose milk content became its unique selling point. The milk churn was later replaced by the ‘glass and a half’ motif that showed two glasses pouring milk into the bar. By the 1920s, Dairy Milk was the UK’s best-selling chocolate bar and Cadbury’s had merged with J. S. Fry & Sons Ltd, another Quaker chocolate-maker, and in 1969 there was a merger of ownership with Schweppes, which further fragmented the family business (though the companies were to demerge in 2008). The 21st century saw more changes – primarily a takeover from US food giant Kraft (now Mondelēz) which changed the classic shape of the Dairy Milk segments from rectangular to curved. Some critics claim the bar also tastes sweeter and more sickly, though the makers insist the recipe remains the same. In 2013 Cadbury’s failed in its attempt to trademark the Dairy Milk purple pantone 2685C, the result of a bitter court case brought about by its confectionery rivals Nestlé. 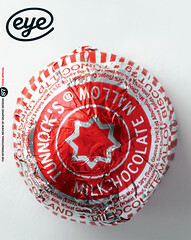 But despite these sticky moments Dairy Milk remains one of the UK’s most popular and recognisable brands. A new version of an older ‘glass-and-half of milk’ image was used, and chunkier serifs came back into vogue, 1980. Top: 1905. 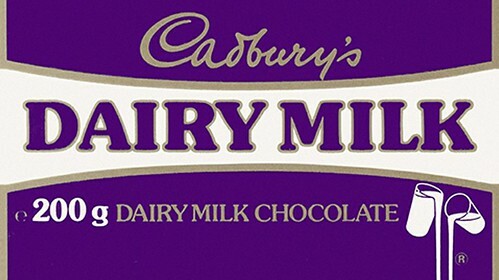 The first Dairy Milk was wrapped in foil branded with the a Cadbury’s logo designed by George Auriol.